I found the triangular meat tin key on Aldi car park recently. My sister spotted it in my purse and gave me the other three "keys" yesterday...all from meat tins, corned beef I think. 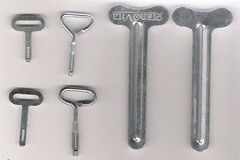 The two large keys are for Squeezing the mushroom pate tube..similar to the PLG key. 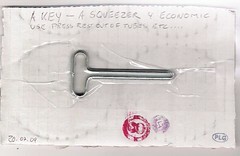 A KEY- A SQUEEZER 4 ECONOMIC USE, press rest out of tubes etc. Another welcome addition to the A1 Scrapmetal collection from PLG.